It's been a roller coaster of emotions deciding what to do about my upcoming race. Full marathon or half marathon? I just couldn't decide. After sitting down to weigh the pros and cons, it became clear that I had to downgrade to the half marathon. Even if I could push myself without injury, I was still looking at a brutal training schedule and would not have enjoyed the experience. In the end, there is no need to risk injury or take the fun out of running just to complete a marathon right now. I am young and know that I will run a marathon when the timing is right. Thank you to all of my readers who helped me reach this decision. Now that I have made the official switch, I am thrilled to announce that I will be running my third half marathon this October. I'm picking up new shoes this week and am looking forward to starting my new and improved training schedule. I have a full 7 weeks to finish building my miles, which shouldn't be hard with my new shoes. For each race, I always try to set a personal challenge for myself. My goal for my previous two half marathons was just to finish, which I did. This time though, I'm going for speed. My goal is to PR so that I can say that I ran a half marathon in under 2:45. I know that I can do it. So here's to my fastest half marathon time yet! In addition to my roller coaster of emotions, I hit up some real life coasters yesterday. 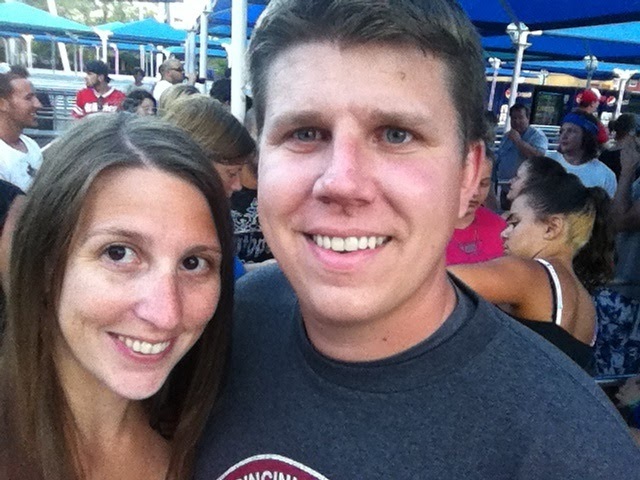 Scott and I decided to take a day for ourselves and headed up to Cedar Point. We could not have asked for a better day. The weather was gorgeous: 80 degrees, lots of sunshine, and a nice breeze from Lake Erie. I haven't visited Cedar Point since I was a teenager so the park felt so new to me. There were so many coasters that either weren't there the last time I visited or had too long of a line to bother with that I felt a little overwhelmed. I'm a roller coaster fanatic so we needed a plan of attack if we were going to ride all the new stuff. Luckily, the park wasn't very busy so the lines were short for many of the rides. 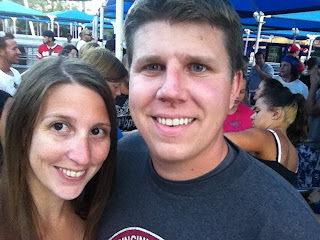 We even got to ride to best two coasters in the park twice: Millennium Force and Top Thrill Dragster. 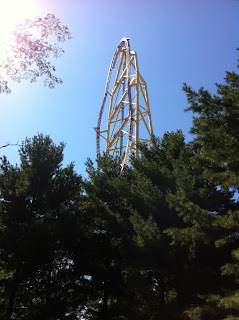 The biggest adventure of the day was riding the Top Thrill Dragster. According to Cedar Point, the ride goes from 0-120 MPH in only 4 seconds and shoots you 420 feet in the air and right back down. The whole ride lasts only 17 second but it was amazing. 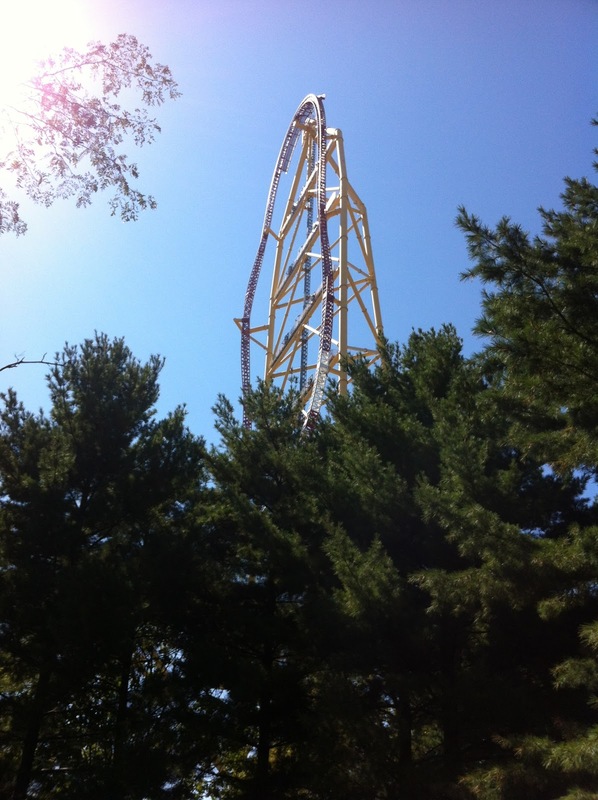 I cannot even begin to describe the rush that I felt on this coaster as well as after the ride when I stood under it and realized just how tall it is. If you visit Cedar Point, this ride is definitely worth waiting in line for. Has anyone else set a goal to PR at a specific race during training or did your PR just come as a pleasant surprise? What's your favorite amusement park? Any other roller coaster fans out there? Do you remember how I said that my feet were killing me during the Cap City Half in May? I blamed the pain on my new Brooks Ghost 4 running shoes not being broken in yet. Unfortunately, the shoes never felt right and I have been struggling with soar feet and shin splints as I have attempted to break them in. After taking weeks off from running to let my shins heal, I have decided that my shoes are to blame. I've been on the search for new shoes but have found that I like the Brooks Ghost 5 the best. I know they are a new design so they aren't the same as the Ghost 4, but am I crazy to buy them since I've had so much trouble with my current Brooks. They really do feel the best out of every shoe I've tried on. At this point, I'm just dying to get back out there and need shoes now. My running store has a 90-day run and love or run and return policy so I can always return them if I have the same problem. My issue is that the Columbus Marathon is in 2 months and I'd really like to have my new shoes broken in ahead of time. If I don't like these, I'm worried that I will be left with little to no time to break in the replacement pair before my race. Another problem I'm facing is that I am so far behind on my training schedule that I don't think I'm going to be able to run the full marathon. I'm scared that I will strain myself by trying to build the miles at this point, but hate the thought of downgrading to the half. Realistically, I think I could finish a full with a 18 or 20 mile long run under my belt but would have to train hard to get there. I'm not sure that I can push that hard coming off of these shin splints. I have until August 31st to make my decision so I'm trying to weigh my pros and cons. Any words of wisdom on shoes? Has anyone else had to downgrade or drop a race? I am excited (and a little terrified) to announce that I am officially registered to run my first marathon. Holy crap, I am going to run a marathon! Actually declaring my intentions to the world is a little terrifying. I used to struggle with a single mile and now I'm voluntarily signing up to run 26.2. While I do have two half marathons under my belt, I'd hardly say that I'm a running pro. Running a marathon is just one of those things that I never thought that I could do, so this October 21, 2012 I'm going to attempt what I once thought was impossible. I have been running but am definitely behind on my training schedule due to studying for the Bar Exam. I'm doing a modified version of Hal Higdon's Novice 1 Marathon Training Guide since I had 14 weeks to train instead of 18. However, now that I'm 10 weeks out from the race, it's time to push for those higher miles so that I can finish the race. As part of my motivation, I am running the race for the shelter that we adopted Ellie from; the Union County Humane Society. I set up a fundraising page and can't wait to see how much I can raise for them. Do you have a favorite charity that you run for? Any advice on training with a modified training schedule? Sorry for the extended and unexplained absence from my blog. I decided it was best to take some serious time away from the internet to study and prepare for the Ohio Bar Exam. I am happy to announce that I completed the 3-day test on July 24th, 25th, and 26th. I can now get back to a normal life while I wait over 3 months to get my results. I will admit that some of the essay questions where extremely hard while others didn't seem so awful. Overall, I feel like I did well but only time will tell. Fingers crossed until October 26, 2012. Now that I have free-time again, I have been enjoying every second of it. 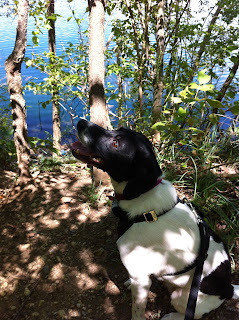 The weekend after the Bar, Ellie and I went hiking at one of our favorite metro parks. 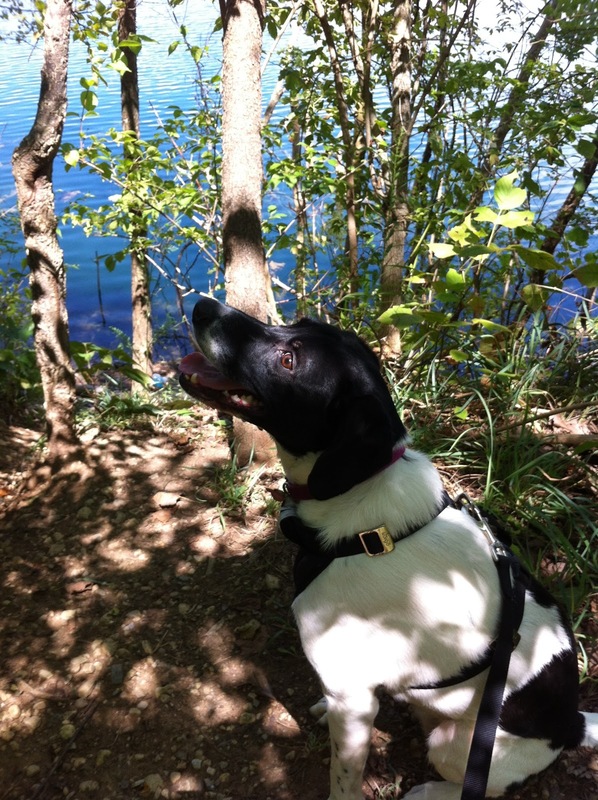 We love it because it features miles of beautiful hiking trails, as well as an off-leash dog park and swimming area. Although Ellie is a lab/pointer mix, she's always been a little timid about getting into the water. However, it was very hot when we went so she gladly splashed around but only let the water go up to her belly. Maybe one day she will enjoy taking a nice swim. In addition to spending our days going on outdoor adventures, Ellie and I have been getting in a lot more runs each week so I am excited to start building our miles back up again. This weekend we even attended the Run Fur Hope 5K to benefit the Union County Humane Society, where we adopted Ellie from. However, we only acted as volunteers since I didn't realize we could run and volunteer :) Either way we had a blast supporting my favorite non-profit. After spending the morning at the Run Fur Hope, I also ventured to the Dublin Irish Festival this weekend to enjoy music, dancing, booze, and amazing festival food. I had never been before, but had a blast so we will definitely be going back next year. Unfortunately fried foods and beer, means that I didn't get in a good weekend run so I'm hoping to hit the pavement tonight. Do you have a local festival that you love attending each year? It's hard to believe that I started my journey as a runner almost a year ago. It all started as a family challenge that my mom presented to my sister and I. "Can we run a half marathon together?" Little did I realize that by accepting that challenge, I would find a love for running during the process. Ellie gets to come with me: I love spending as much time outside with my pup as possible. Running allows us to spend even more quality time together. Since Ellie loves to run, she sees running with me as a treat so it's a good time for everyone involved. I get to enjoy beautiful scenery: I don't think I ever realized how beautiful Columbus and it's surrounding suburbs are until I started running. Now, I get to enjoy the city, parks, and my own neighborhood every time I head out for a run. I also love exploring new places to run so I'm constantly finding new routes. Running is relaxing: Hitting the pavement at the end of the day really helps me clear my mind and destress. Whether it's a quick run to get out some frustration or a long run to really allow me time to think, running has been my outlet. Running keeps me active: I've always been a very active person and love team sports. However, the past few years have been far too busy for me to commit to a team and specific schedule. 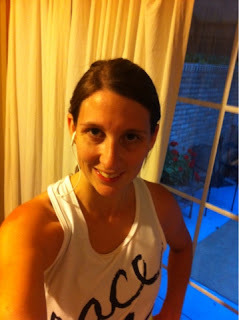 Running allows me to continue being active and I can fit it in where my schedule allows. I love a challenge: Running has sparked my competitive spirit. I may not be running to be the fastest person in a race, but I'm still competing with myself. With running, there are always new goals that I can set for myself and new races to conquer. These are all things that drive my desire to run. Did you celebrate National Running Day with a run? What do you love about running? I have always felt safe on my running routes. I live in a nice town, run during the day, and stay on well-traveled sidewalks/trails. If I do run when it's dark, I always have a running buddy or Ellie with me and only run in areas that are familiar and well-lit. I also think it's important to run with only one earbud in. This way I can listen to my music while still being aware of my surroundings. I, for one, never let my guard down so I'm always paying attention to anything out of the ordinary. I recently noticed a man parked in the guest lot at our condo complex. I noticed him last week as I left for and returned home from an evening run and again yesterday morning. He just sits in his car which I find highly unsettling. Regardless of what he was doing, his presence served as a wake-up call. While I know calling the police is the first step in ensuring our safety here, the second step is reminding all of you to be careful out there. I think that I will be adding mace to my running belt. What do you do to keep safe? I know I was supposed to start my new training schedule today. However, the weather forecast was looking super crappy so I went for a run last night instead. A storm was slowly rolling in so it started to get dark a little earlier than usual last night. I quickly put on my new 'Race Ya' tank and headed out the door with Ellie. Luckily, the first run on my training schedule called for a quick 1.5 mile run so that we could make it home before the storm. We ran down a few neighborhood streets since it was such a short run. I don't normally run the neighborhood streets because Ellie gets distracted too easily by all the people and dogs that are usually out. Surprisingly, we only passed one person. Of course it was a neighbor that I know so I gave a quick wave and was on my way. Then I felt a sharp tug. Apparently, Ellie didn't get the memo that we were just giving a passing hello to our friend and her dogs. Although Ellie is pretty good with the 'leave it' command, she seemed to lack self-control when she saw her friends. After two attempts and my stern voice, she finally gave up and decided to continue on the run. Am I the only one with this problem? The rest of the run was pretty uneventful: just how I like it. Once we arrived home, I had a slight pain in my left knee so I iced it. I've never had knee pain so I will have to keep an eye on it. My knee felt fine this morning so I'm hoping that it was just a little soreness from taking such a long break. I also have found that I might need an armband to hold my cell phone. I found this awesome giveaway on Karen's blog so hopefully I win. You can enter too, just head on over to her blog. I'm Heather and that's my dog, Ellie. I recently discovered a love for running and Ellie loves to join me. Together, we spend a lot of time hitting the pavement/trails. I decided to create this blog to serve as my running log. I want to be able to record my progress, create a sense of accountability and hopefully inspire others as I continue on my journey as a runner. One of those Running People?